Occupied areas Lorraine 1940, no. 10, 25 Pf. Vivid violet ultramarine and no. 11 30 Pf. Green with overprint Lorraine on registered cover to Altentreptow. Tied by auxiliary cancel - rectangular cancel in blue-violet, centric Forbach. 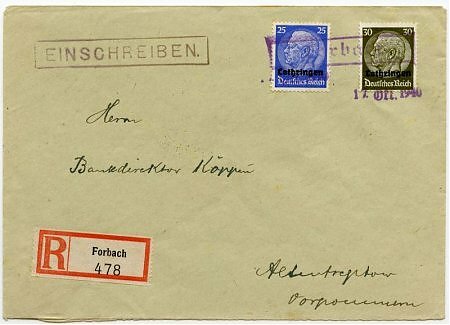 Reverse arrival postmark - two circles and bridge cancel ALTENTREPTOW c 18.10.40.-18. Clean overall condition.